So, it's time for another vacation blog. This one will be pretty random, lots of pictures, fewer words, promise. I love that man and mouse. The obligatory Teacup pictures. 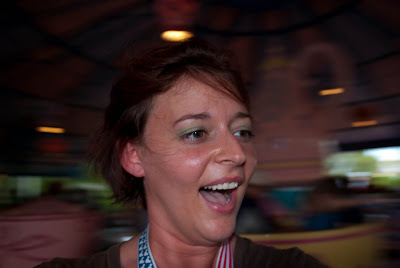 I only go with SoldierMan on the Teacups, abusing my total lack of equilibrium and extreme susceptibility for motion sickness, for the sake of the motion blur picture. This was a completely accidental picture. Neither one of use knew the other was making that face. We thought we were so slick pulling off a silly face in the other person's "serious" picture. This is what happened. 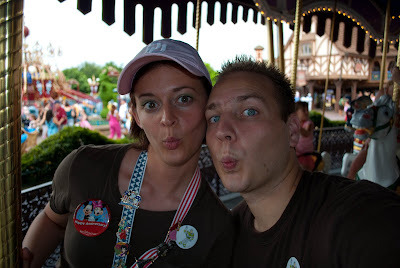 Disney makes us goofy. Okay, this was an awesome new find this year. 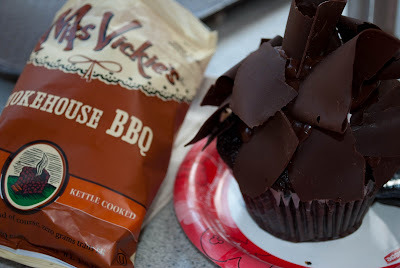 The most amazing cupcake EVAH! Peanut Butter Chocolate Fudge. The chip bag is there for perspective. 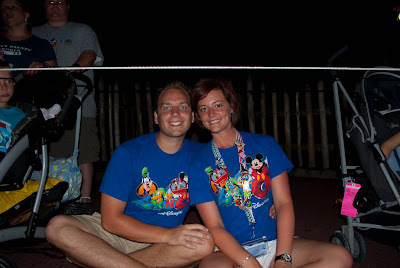 Our "official" 2009 picture. (The one that goes in the frame.) Those shirts were a big hit - always are. At our fav restaurant, Ohana. 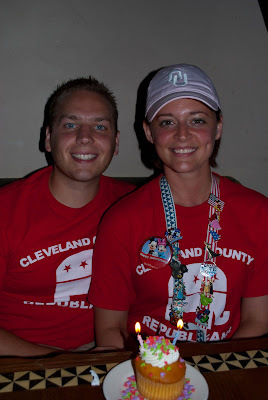 The cupcake was for our anniversary. Waiting for the bus. We did that a lot. 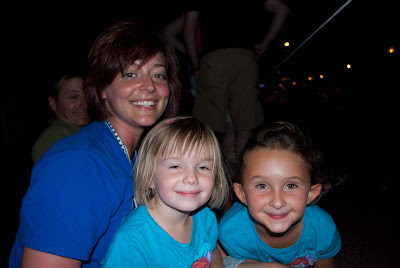 Waiting for the light parade in MK. My friends, Audrey and Claire. They were sitting next to us waiting for the parade. The little one, Audrey, started talking to me and after about 20 minutes asked if she could sit on my lap. Like I could say no! There is no "stranger danger" radar at Disney! Pictures only show so much, and I've shown you about 1/4-1/3 of the pictures I took (none particularly artsy or clever) but hopefully you've been able to see some of the magic the place holds for us. 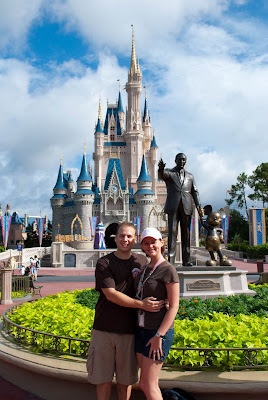 We went to Disney on our honeymoon, our 1st anniversary, and now our 2nd anniversary. Because of everything happening over the next year, the likelihood that we'll get to continue the tradition in 2010 is close to nil. So this was a very special trip for us, as will be the next one. You and your hubs are so silly and fun! Yay for Disney! 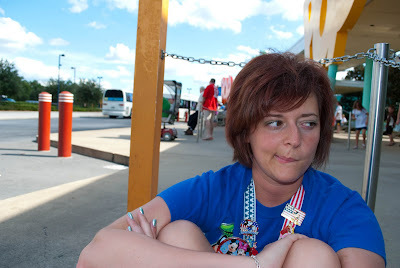 I love WDW. I've been twice and want to go back so bad! I can't convince Sean to go though. I know he'd have a good time, but he's convinced it's a kids place. 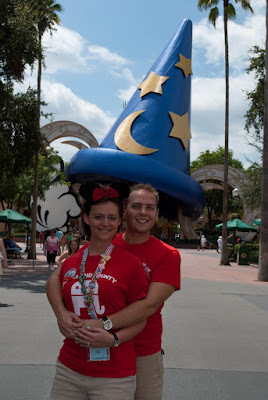 You and the hubs took such cute pics. 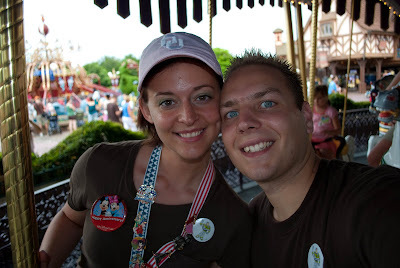 I'd have a blast with you two at WDW! Those are great pics - they brought a smile to my face, so I can imagine how good they make you feel when you look at them. 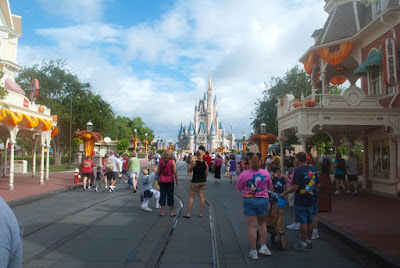 I haven't been to WDW since I was a kid, but I have wonderful memories of the place. I want to go back with DM and his kids really bad.